Brazilians love sweet things. For example, they take much sugar in their coffee, and drinking it, they eat a sugary chocolate cake! Therefore, there are a lot of sweet foods in Brazil. 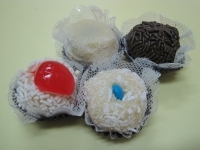 "Brigadeiro" is one of them, and essential for various parties in this country. ② Turn the butter onto a plate and let it cool. ④ Decorate it with chocolate spray, coconuts, and so on. If you have a chance to go to Brazil, please try to eat it!